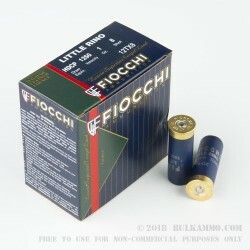 This low-recoiling 12 gauge shotshell ammo from Fiocchi is perfect for sporting clays. 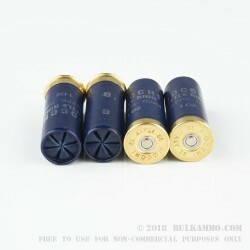 Each 2-3/4" shell in this bulk priced case of 250 fires an ounce of #8 birdshot with a muzzle velocity of about 1,250 feet per second. 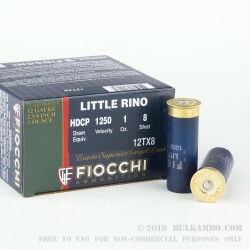 The reduced kick from these loads is particularly useful for long shooting sessions as well as recoil-sensitive users. 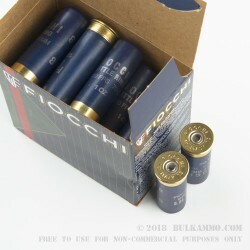 Like most Fiocchi ammo sold in the US, these shells are loaded at Fiocchi of America's manufacturing facility in Ozark, Missouri. They offer excellent shooting quality at a reasonable price.